Spiritual care, whether or not it is associated with religious beliefs, is essential in end-of-life care. This book is about talking about death in accordance with our various beliefs and practices. That applies to any individual with regard to their family, their friends, or themselves. In our case, it also applies to the patients and their families that we care for. But, when viewed globally, the diversity of cultures and religions is daunting. The first part of the book explores the clinical and spiritual care available to the dying and their families across broad geographical regions of the world, and includes two chapters by former Chairs of IAHPC – Kathleen Foley on the USA and Eduardo Bruera on Latin America. At the end of the section are two very good chapters by Charles von Gunten and Christina Puchalski. Von Gunten discusses the benefits of holistic care that incorporates spiritual care, first demonstrated (in modern times) by Dame Cicely Saunders at St Christopher’s Hospice in London, and how we should be trying to educate all those who deal with the dying that spiritual care is an integral part of the deal. Puchalski leaves another gem about how spiritual care can and should be practiced at the bedside. The second part presents a series of five case studies dealing with difficult situations: When emergencies happen, When disease progresses, When dying may be a long process, At the time of death, and After death. Each is discussed by a clinician and an ethicist, as well as ‘thinkers’ from the world’s 13 most prevalent spiritual traditions. The answers and opinions to the case histories are interesting and informative, but sometimes leave questions unanswered. For example, for the woman with advanced Alzheimer’s disease, is it acceptable to not implant a feeding gastrostomy, knowing it is possible that she might die sooner from aspiration pneumonia? Some respondents gave clear answers but some didn’t. This book provides a lot of information about other cultures and religions that is specific to palliative care, and is a timely reminder about how often we should be stepping back and asking ourselves what the cultural or religious expectations of the patient and family might be. And, as a bonus, there were essays by well-known palliative care people whose writing I have come to respect, such as Ira Byock, Betty Ferrell, Daniel Callahan, David Kissane and Mary Vachon. The editors emphasize that this is a sourcebook, allowing you to look up particular things when you need to, and is not meant to be read straight through.The book may provide specific answers to your enquiry, and what’s here will certainly point you in the right direction, but looking for information about the intricacies of spiritual care is not like looking up the doses of drugs. The bottom line is that you can read it however you want. The other bottom line is that anyone who works in palliative care will find this book both informative and interesting. Then I wondered who had put all this together. There is no mention on the back cover or in the list of contributors (despite the fact that they contributed a significant part of the text) as to who the editors are. It turns out that Mark Lazenby is Associate Professor of Nursing at the Yale School of Nursing and a nurse practitioner in advanced oncology as well as having degrees in theology. Ruth McCorkle is Professor of Nursing at Yale and worked and studied with Dame Cicely in London. 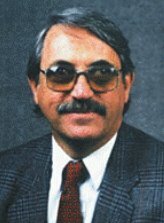 Daniel Sulmasy is Professor of Medicine and Ethics in the Department of Medicine and the Divinity School at the University of Chicago. That answered a few questions. They should be congratulated for their attempt to address spiritual care on a global basis, and for attracting a first-class list of contributors. I thought this was a quite remarkable book. This is a book for caregivers, about how to make the caregiving journey easier and more meaningful for the caregiver, and hopefully better for the recipient of that care. It is written by a social worker with 30-plus years’ experience in the field of geriatrics and who was also the caregiver to her own mother for 17 years after she developed Alzheimer’s disease. Kriseman draws on both her personal and professional experiences and comes across as someone who not only knows what to do, but also knows how it feels. Having worked with many caregivers who felt exhausted and frustrated, or hopeless and helpless, she noted how few of them made any special effort to look after themselves. When her turn came, she determined to go down the caregiver path with intentionality, in a mindful way, for which she needed to make sure she was taking care of her own physical, emotional and spiritual health. 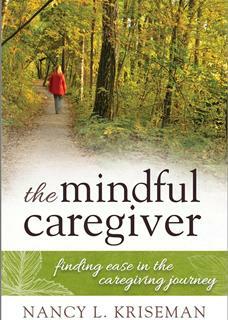 So this book is about mindfulness, or taking care of oneself in a balanced and healthy way, for caregivers. ‘Mindfulness can help bring self-awareness into focus. It reminds you that you matter! … to be kind and gentle, non-judgmental, and compassionate with yourself. It can help you prioritize, set limits, stay true to yourself, and ultimately feel more at ease…’ And injecting some mindfulness will help you view each stressful situation as an opportunity to learn and think, as well as introducing you to a wider range of caregiving practices, all of which should result in better care for the person being cared for. She starts with the caregiver’s role, how mindfulness can be incorporated and how that might help. She discusses why self-care is important and ways you might go about it. Then there are the important roles of the caregiver in advocating and helping navigate the maze of professional resources, supports and services. And, finally, there is a chapter on grief and bereavement. There are a large number of examples and clinical anecdotes, covering a wide range of problems. I think this book is very good and it is certainly down to earth and practical. I would be very comfortable recommending it to any caregiver seeking help with their role. Whilst it would be bread and butter for a social worker or an experienced palliative care nurse, I did wonder how your average caregiver would deal with it. It covers a lot of territory and I found it a bit heavy in places. The system of headings did not lead me through the text and I was looking for lists of content at the beginnings of chapters or sections of chapters that would guide you to the bit that particularly concerned you. This addition to the pocket-sized Oxford Specialist Handbooks in Oncology sets out to discuss the management of complex cancer pain, which is defined as ‘cancer pain that is either multifactorial in nature or is cancer pain that has not responded to simple, conventional treatment approaches’. Each chapter on therapy is a case-based discussion of one or more patients with difficult cancer pain, including pelvic pain, chest wall pain with mesothelioma, unilateral limb plexopathy, upper gastrointestinal pain, and bone metastases. The opening chapter by Mike Bennett on cancer pain and Makin’s overview of the pharmacological treatment of cancer pain were crisp and to the point and I was looking forward to the rest. But while subsequent contributors provided good information about interventional procedures, other therapeutic possibilities, especially palliative radiotherapy, barely rate a mention. The chapter on chest wall pain due to mesothelioma offered a range of invasive pain control techniques, including cervical cordotomy and tunnelled epidural catheterization. My experience is that a short course of palliative radiotherapy is non-invasive, has few side effects, and is usually effective; but radiotherapy is not mentioned. The woman with osteochondrosarcoma of the pelvis, whose only objective was to have a holiday in Europe with her partner, is offered a variety of invasive pain control procedures and even amputation of her leg; palliative radiotherapy is not mentioned. Even if it was only to discuss why it was less appropriate than the procedures offered, it deserves to be mentioned. The contributors to this book are interventional cancer pain specialists and they provide good information about the interventional procedures. Some of the procedures described, such as coeliac plexus block, are standard and of proven worth to the patient. But others require careful consideration. Whilst the pros and cons of the interventional procedures themselves may be well described, I did not come across a single balanced discussion where all the therapeutic possibilities were discussed, including non-invasive alternatives such as palliative radiotherapy. As such, it does not provide any perspective as to where these interventional techniques sit in the bigger picture of patients’ overall care. Whilst I am not a radiotherapist, I had to take exception to the ‘footnote’ about radiotherapy on p299, written by a geriatrician/palliative medicine specialist and the chief of a cardiac critical care unit from New York. It states that palliative radiotherapy is given in shorter courses to lessen the burden of transporting the patient to therapy; it is (or should be) given in shorter courses because that produces equivalent benefit in the palliative care setting. It states that palliative radiotherapy is only indicated if the patients have a life-expectancy of more than four weeks; my understanding and experience is that higher-dose, shorter-course palliative radiotherapy can be effective in a much shorter time. Down the page they state that radiotherapy for painful bone metastases is usually given in 10 fractions, and then acknowledge that multiple clinical trials have shown single-fraction therapy to be equally effective for palliation. On p 67, I came across: ‘Unless detected early and instituting curative treatment, the outcome of palliative treatment, although could prolong the life, would need a multidisciplinary approach for continuing care in the domiciliary setting.’ I have come to expect better from OUP. This book should be retitled Interventional Therapy for Difficult Cancer Pain (which sidesteps my objections), or a radiation and medical oncologist should be included in the editorial group so that it provides a balanced overview of the management of difficult cancer pain. The optimal management of patients with amyotrophic lateral sclerosis (ALS), or motor neurone disease, and their families remains challenging. There seem to have been some significant advances in our knowledge about the disease since the previous editions (2000 and 2006) but, unfortunately, these have not yet resulted in therapeutic advances, and the glutamate release inhibitor riluzole is the only substance that has shown a significant (and very modest) effect on survival. The opening chapters provide a description of the disease, where palliative care can usefully be employed (through the whole course of the disease), and discussions about communication, decision-making and advance directives. Following this are chapters about the control of symptoms including respiratory complications, dysphagia, cognitive dysfunction, and pain. The next section deals with the multidisciplinary nature of the care with chapters on psychosocial care, spiritual care, physiotherapy, occupational therapy, speech therapy and nursing care; these underline the role of the different individuals, rather than referring to generic ‘team care’. There is a new chapter on the use of complementary and alternative medicine, which draws no conclusions but recommends keeping an open mind. The chapter on ethical issues in end-of-life care provides a sober discussion of physician-assisted suicide and euthanasia, but stops short of describing any shortcomings of the systems in place in countries like The Netherlands. 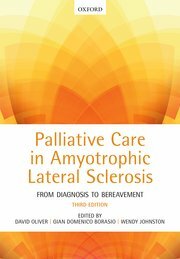 The chapter on medical end-of-life care, as previously noted, will be particularly useful for inpatient palliative care services that may first see an ALS patient when they are already terminally ill. Very good, if a bit expensive, but I would want to have it if I was responsible for looking after patients with ALS.